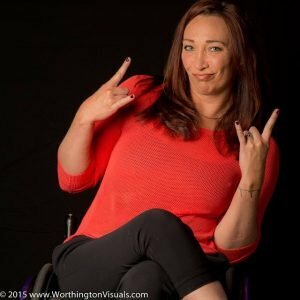 Amy Van Dyken-Rouen has been selected to be the 2017 recipient of the Invisible Disabilities® Association’s Invisible No More® Perseverance Award. Amy has been chosen based upon her amazing perseverance as she lives each day since childhood with life threatening asthma and the more recent excruciating pain and trauma caused by a spinal cord injury and subsequent paralysis from a major 2014 accident. In spite of Amy’s circumstances, she shares her story, all of the struggles and triumphs, in order to encourage others on their personal journey of loss, illness, pain and disability. Van Dyken-Rouen has the distinction of being one of the few Olympians whose medals are all gold. In 2007 she was the only American swimmer to be inducted into the International Swimming Hall of Fame‘s Class of 2007. She was also inducted to the Olympic Hall of Fame in July 2008.